Kimplas manufactures Spigot Fittings Elbow 45 Deg. Spigot fittings are sourced from well known and reputed European sources and are guaranteed by Kimplas. 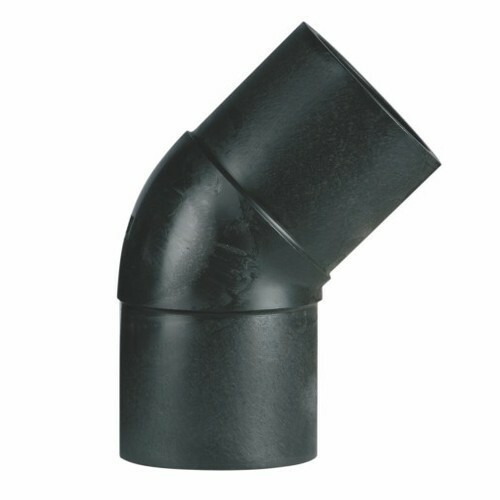 Outsourced Spigot fittings supplied by Kimplas are manufactured in PE100 (Black) grade and are Standard SDR 11117.6 rated. They are suitable to weld SDR 9 through SDR 21 or PN 6 through PN 16 pipes both in straight as well as coil form. For exact recommendations on compatibility for welding, refer Kimplas Technical Specifications Manual. Pipe Connections of service connections, pipe stub ends etc. Joint preparation must be done as specified in the installation instructions. Pipe outside surface must be scraped to remove oxidized layer. Before fusing. pipe ends and spigot end of the fittings must be cleaned to remove dirt and contamination. Complete Installation Manual be downloaded. Kimplas Piping Systems Ltd. was established in Nashik,India in the year 1996 to produce Electrofusion (EF) Fittings for use in Gas and Water Distribution Systems and Industrial Applications. It has a “Pioneer Manufacturer” status in India for production of EF Fittings as it was the first to manufacture and introduce EF Fittings in India. By now it has supplied millions of fittings since 1997. It has successfully introduced EF Fittings in Drinking Water Systems and is today the Market Leader in India both in the Gas and Water Segments for EF and Compression Fittings.